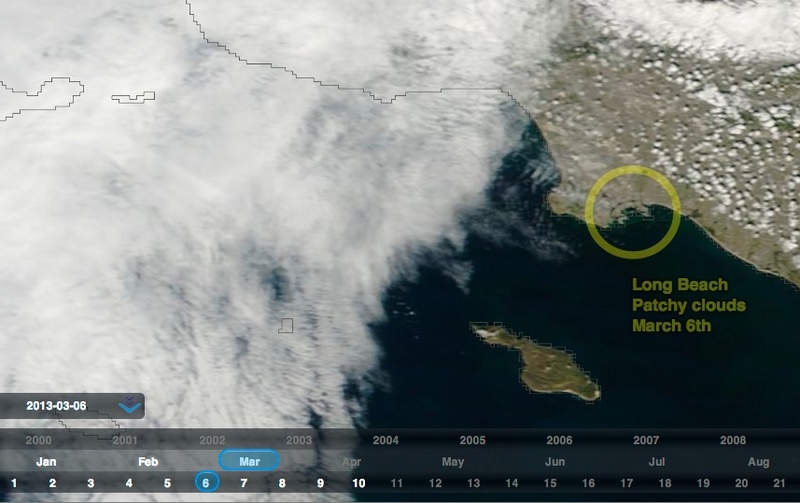 Debunked: V3Solar's spinning solar panel cone spin cell "CoolSpin"
Discussion in 'Science and Pseudoscience' started by Mick West, Feb 12, 2013. There's a type of scam out there that's being going on for at least 100 years. A company claims to have invented or discovered something that will make a lot of money. Quite often this will be in the field of energy, although we see them more and more in the field of weather control and information technology. The company can demonstrate research, they will often hold one or more patents on the technology, and they will have some kind of prototype that does not actually fully work, but they claim is a demonstration of the proof of concept. They won't reveal all the details, despite having filed patents, because they either don't want people to steal their ideas, or they claim it's too early, and more research needs to be done. What they are looking for though, is investors. They will talk about the huge potential market, and hence the huge amount of money to be made. They will get people to invest in their company. The technology will go nowhere slowly, and eventually the principals will withdraw, and the investors will end up with nothing. The scam works because it's not illegal to be wrong, unless you actually know you are wrong. So if you think you've discovered a form of free energy, it's perfectly legal to set up a company to research and develop the technology. It's quite legal to solicit investment based on what you think is correct science - even if it does turn out to be wrong, and the investors lose all their money. They took a risk, they lost. It's quite legal to pay yourself and the other principals a large salary. So all you have to do to run such a scam is to never admit you knew it was a scam. You have to pretend you believe in the technology. Then when it fails you simply keep insisting that you thought it worked, and you were sorry you didn't get enough time to work out the kinks. Then of course there are those people who actually ARE convinced that their technology works. There are plenty of people who think they actually have discovered something new, and they just need a bit more research to make money from it. So which of the two is V3Solar? 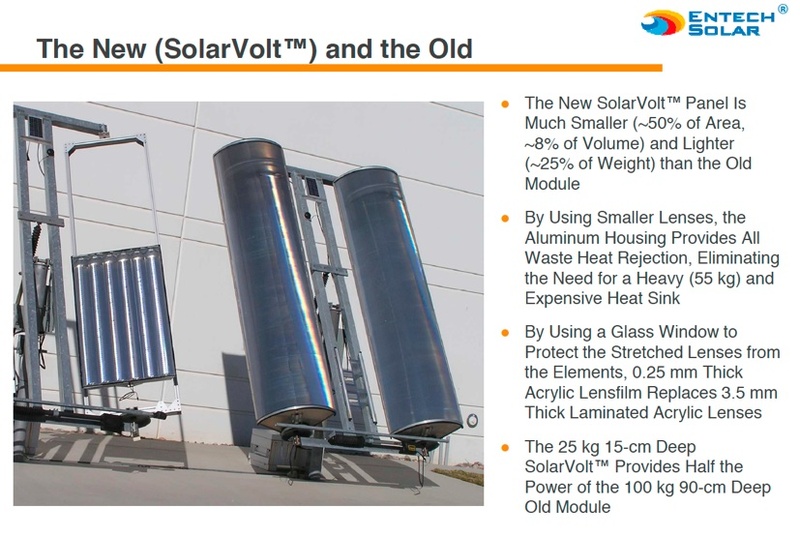 V3Solar claims to have invented a technology that makes solar energy 20x as efficient. They do this by magnifying the suns rays with a lens, so you get 20x as much sun on 1x the area. Now regular solar cells don't do this because the cell gets really hot, and breaks. V3Solar claim to have solved this by mounting the cells on a rotating cylinder, partly so that the wind from the rotation cools the cells down, but mostly so that only 1/20th of the surface is exposed to the concentrated sunlight at once. The problem is they seem to forget that multiplying something by 20 and then dividing it by 20 does not equal 20. It equals 1. So they are right back where they started. Plus since half their solar cells are in shade, then it's really 0.5, and since they are on a curved surface, it's more like 0.3. Oh and not to mention that the solar panels are enclosed in a glass cone, so will actually get quite a bit hotter than regular solar panels. The cone is mostly constant thickness glass with zero magnifying effect. The "lenses" are the ribs, glass tubes. So let's say those glass tubes are concentrating the sunlight 20x. The problem is that all that light which is now concentrated would have fallen on solar cells anyway. The net amount of sunlight (and hence harvestable energy) falling on the cells is unchanged. And since most of the cells are not facing the sun, then it's going to be very inefficient. One could do a very simple experiment to see if this approach is at all viable. Just get a magnifying glass that the same area as a solar cell, focus it down to about 1/20th the area of the cell, then move it rapidly over the surface of the cell, and compare the power output against direct sunlight. Through the patented CoolSpin technology energy is constantly provided from one sun mono PV that remains cool from the spin. The heat generated by the concentrated lens does not have enough time to transfer to the PV as it cycles out of the sunlight into the shade allowing the next piece of standard PV to go through exactly the same process, again, and again, and again. Constant cooling through dynamic spin creates higher power generation and longer life of the PV. This is nonsense. Sunlight is electromagnetic radiation. It all travels at the same speed, and it all hits at the same time. The cell is not heating up, because it's only getting a small fraction of the heat, and it's only getting a small fraction of the energy. Which basically suggests there's a small efficiency gain by using concentrated pulses of light rather than constant regular sunlight. In looking at the costs of the Spin Cell, it makes sense to outline the savings possible in comparison to flat plate PV using the following “round numbers” example. PV costs approximately $100 per square meter. The lensing material for the outer cone of the Spin Cell costs approximately $10 per square meter. The cost per watt of the Spin Cell can be reduced by increasing the ratio of the lensing material to the PV. If one square meter of PV costs $100 and produces 200 watts, and one square meter of the lensing material that concentrates the sunlight in the Spin Cell 20 times would only cost $10, then 1/20th of the PV would be required to produce 200 watts, at a cost of $5 for the PV. In this case, the Bill of Material (BOM) costs would be $15 instead of $100 for the flat panel. Combined with the image of the cone, this is utter nonsense. 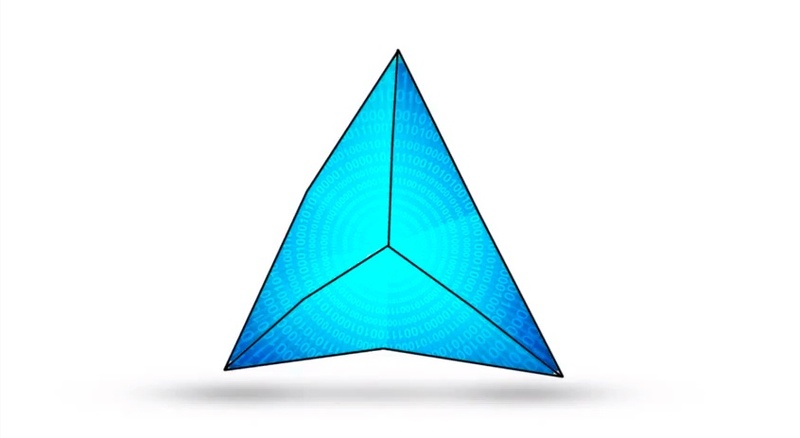 The lensing material in the cone is NOT 20x the area of the PV (the blue triangles). It's about 1/8th the area. About 100x SMALLER than the ratio they are claiming. Even if the entire cone was covered in lenses, and the inner PV cone was half the size, then the ratio would only be about 4x. Their numbers do not add up. But unfortunately for investors there is no law against being bad at math. The following text was originally at the top of this post. I've moved it because V3Solar have modified their claims over the last few months, and I've talked to Richard Styler and Michael Neistat, and as far as I can tell they honestly believe in the technology, but don't really follow all the science. Characterizing their entire endeavour as a possible scam is perhaps over-broad. However I stand by the analyses done here, and I continue to have concerns regarding the accuracy and significance of the claims they are making. Since V3Solar have actually followed the normal patterns of promises, investment, then vanishing, I've restored the text to the top of the post. I have to say, this is one of the best written pieces I have read on how the 'free-energy' scam is able to legally operate. I wish more people would think rationally enough to not fall for these scams. V3Solar contracts industrial design team. "been verified through third party testing to produce over 20X more electricity while using the same type and amount of photovoltaic (PV) material as flat, static panels"
Can they get away with this? Arguably yes, because in theory you could get a 20x magnifier, and focus it on a small PV, and you'd get 20x the energy as without the magnifier. So the statement is "correct", in theory. Plus they can always blame the "third party" for getting it wrong. But the fact remains, this is not what their Spin Cell is doing. 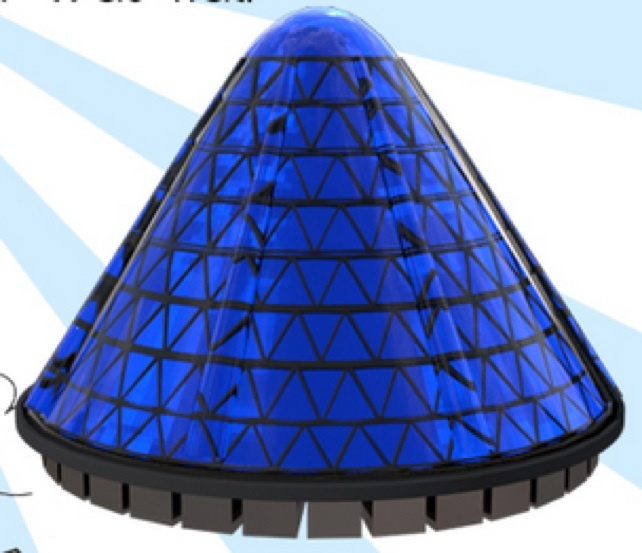 The physical model is just a spinning cone covered with PV cell. It has no magnification. The animated CG visualization has a magnifier, but it's smaller than the PV, not larger. These all sound great. There's cheap solar, cheap desalination, and cheap broadband internet. All of which have HUGE potential markets, and all of which would be amazing opportunities for investors to get in on the ground floor. Hydrophasec technology proves that the ionic bond between water and the dissolved sodium and chlorine can be broken using vortational flow of the water in concert with induced resonance according to Holophasec Vortex Mechanics principles in a low energy operation. The desalination chamber is designed to establish a saline gradient where fresh water is easily removed from the brine stream. Holophasec techniques can also be developed to utilize the brine stream and not regard it as waste. Finally, the output of the desalinator also provides for highly structured (coherent, healthy) water as opposed to traditional municipal water sources. 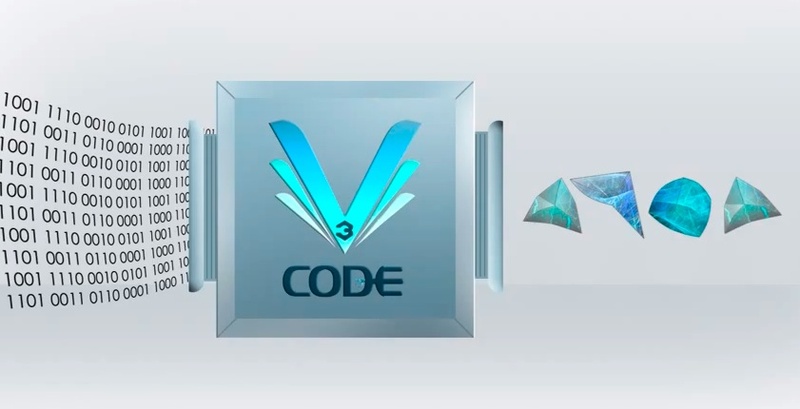 The inventions novel Resonant Vortational Division Multiplex (RVDM) is based upon the application of resonant digital data vector (RDDV) encoding and decoding that are mathematically defined in terms of fractalized data unit vector symbolic structures (VSS). One phase fractal envelop equates to one V-Data Unit, one V-Data Unit equals one conventional data byte-data unit. The inventions Resonant Vortational Division Multiplex (RVDM) modulation scheme can be used to encode/decode data within the same channel bandwidth allocation. “Bandwidth” in a conventional sense and in this case becomes an irrelevant reference point. Data frame rate is based on sample granularity, not bandwidth. Data bit framing would be to send one phase fractal envelope which equals one vortational data unit which equals one data byte per reference cycle. Using a 220 MHz reference center frequency as an application example, a translation state-engine with internal lookup tables will easily handle decoding one bit frame every 4.5 nanoseconds. This translates to 27 Megabytes per second. It is useful to compare this data rate to the rate available using conventional approaches. In the example cited above, the bit/byte multiplication ratio ranges from 1700:1 to 5500:1. Higher ratios are anticipated under real-world conditions. Sounds good if you know nothing at all about information theory, or signal processing, or the internet, or even the power grid. But it's basically nonsense. Do they know it's nonsense? Hard to say, but easy to be suspicious. It almost seems like something you'd see on the Onion. Is it possible that Styler has somehow become convinced that this will work? Or is he just doing his job? Perhaps they realized just how implausible this looked. They never actually explain how these shapes actually travel down the wires, or how they know which house to go to. There is no singularity, no one single point of reference, no finite axis of perception, no linear progression of time, and no continual relativistic positions to ascertain any perpetual point of reference that we can hang our hat on in perpetuity, and this fact is very difficult for humans to grasp. However, for the purposes of this disclosure the concepts of time and space are utilised as part of the terminology disclosed here simply because all of our current communications technologies are focused upon ideas time domain measurements with respect to methods of modulation, and the fundamental viewpoints of science, philosophy and mathematics are hinged upon the central idea of a linear progression of time as we occupy and experience space. The term Holophasec denotes and connotes an infinitely malleable and adaptable 3D geometric symbology that codifies an n-dimensional 3D symbolic state that is derived, coded and viewed stereoscopically in all three spatial dimensions as referenced to the three-dimensional Wave Matrix base band carrier signal. Each Wave Matrix is a electromagnetic piece of a dynamically malleable Hologram in that is not static for it constantly oscillates, moves and comprises a harmonic totally that is greater that is constituent elements. A Holophasec 3D Modulated Magnetic Moment for example may be considered as a piece of three dimensional information that is part of a more massive hologram that is not limited in just visual terms. The core concept of Holophasec 3D extends the reality of a hologram beyond the world of static cinematically defined visual images. Holophasec symbology includes but is not limited to the reproduction and containment of Holophasec 3D periodic fields that comprise and create visual-holograms, auditory-holograms, olfactory-holograms, taste-sense- holograms, and tactile kinetic information, and the like. The Holophasec 3D Modulated Magnetic Moment can also be viewed as an oscillating periodic 3D field of electromagnetic, sound and materially kinetic reality that possesses no limitations of physical, mathematical and or symbolic orientation. In that its harmonic whole is the discrete symbolic container that conveys information continuously when linked logically from unique physical positions and symbolic states to another unique physical position and state without corruption, or reduction of resolution with respect to the quantisation of information. Conventional Nyquist quantisation that is nothing but an approximation of the original information recorded, assembled, periodically disassembled and propagated and re assembled for playback in its original form to the user so selected. Maury Markowitz is very skeptical of the idea. A discussion where Robert Styler, V2Solar's PR guy, tries to explain things, with little success. Styler responds to critics, mostly with hand waving. And there's continuing discussion in the comments. This brings up another question — there is only 1000 watts of light in a square meter, etc. We understand that. It was a major stumbling block for me and it took me months to wrap my mind around it. There is a staircasing, or additive, effect of light, as the PV spins rapidly under multiple lenses. I am not going to go into the specifics here, because it is almost irrelevant. The outer lensing cone is a nominal cost. In our BOM costs, we calculated it being 2.5X bigger than the size we believe it is going to be. If it ends up being 5X bigger, it would still only add 5 cents/Wp to our BOM costs. If there is no staircasing, we simply make the outer cone bigger. "If there is not staircasing"!!! First he says there is, and then that there might not be. Seems like he's hedging his bets there. Thank, that was actually the article that got me started writing the debunking (and is linked in the previous comment), because in it David Roberts totally fails to answer any of the actual objections. In particular the total lack of real solar concentration in the design, and his nonsensical response to the problem of cooling something that's under a cone of glass. Cannot find any news yet on their big moment in the sun..
Next week is our live demonstration of the CoolSpin in Long Beach, CA on March 6, 7, 8th. We are praying for sunny days. Taiwan is sending an entire delegation with their EPA and Science Council and they have asked for a closed session on the 6th (I wish my own government in the U.S. was as proactive and motivated to lead the renewable energy revolution). The other two days will be in groups, so if you are a potential stakeholder or investor, come see what all of the buzz is about for yourself. This is private event so send me an email on the type of strategic alliance you envision and if we see a fit, we will share all of the particulars. Once people see the CoolSpin working live, it will remove any confusion regarding the technology. Many of you have contacted us about investing. If you are interested in this round at this valuation, now is the time (our minimum investment is $50,000, and if you live in the U.S., we can only work with accredited investors). We will be sharing updates next week and I will film the CoolSpin charging in the sun for all to see (please let it be sunny in So Cal). Documentation beats conversation. If the outer stationary shell is hermetically sealed how is any interior motion supposed to produce a cooling effect to offset the heating inside what is essentially an unventilated greenhouse? They compare the effect of concentrating sunlight to what they call the penumbra effect relating it to the elusive "green flash" seen at sunset, but the green flash is a result of refraction and scattering of light, not the concentration of light. They also claim the green flash happens for two brief moments each day at sunrise and sunset, but the truth is that the green flash is only visible to an observer in the right location under very specific conditions in the atmosphere. Allegedly direct current produced by the PV panels is used to spin the cone and power electromagnets along the bottom of the spinning cone which move past stationary electromagnets in the base which is supposed to produce alternating current, like a standard generator. Huh? One of many questions is how do they plan on keeping the electronics cool inside an unventilated greenhouse? Their description of how AC is generated is a bit off as well. Besides, converting to AC doesn't make sense considering the batteries that are required to store energy for use overnight produce DC and are charged by DC. AC conversion has to occur downstream from the batteries, not upstream. Apparently the minimum investment they're seeking from individuals is $50,000 US. I can summarize "CoolSpin" in three words... SCAM, SCAM, SCAM. And who are you, unregistered, to be defending this most obvious ruse? I mean, today is two days after the demonstrations... where are the results? The live demonstration report from the Company - says proof of concept accomplished. The above results were taken at different times of the day. (1:15 and 2:43) so the results are not valid. Simultaneous readings are needed to verify any actual difference. The magnifier seems to be at least 5.3x the diameter of the concentrated spot, hence it's at least (5.3/2)^2*pi = 22x concentration. Probably more like 25 as the flare makes the bright spot cover more pixels than in reality. It's a little fiddly to tell. But unless they release some actual measurement of the dimension of the device, and the control cell, then their claim of 21.5X power from a 20x concentrator is meaningless. The weather that day was patchy clouds, making the timing of the test much more important. An hour and a half could result in vastly different conditions. The fundamental problem though is that their spinning cone idea is entirely unrelated to this setup. The spinning cone cannot concentrate the sun 20x, as explained in previous posts. The magnifying ribs can concentrate the sun locally, however no more sun is actually hitting the PV cells than if the ribs were not present. They claim some increase in efficiency from this "pulsing" of the concentrated sunlight, but the above demonstration is entirely unconvincing. And even if it were genuine, the extra cost and maintenance of the mechanical system needed would outweigh the ~7% increase in efficiency. Mick, FWIW there is benefit to cooling the solar panels as they make more power when they are cool. A real-world example is the power output of my solar array on the roof here in full sunlight, then when some clouds come over, then when they go and it gets full sunlight again. The power output might be, say, 4 kW initially then it'll drop to about 2kW but when the clouds go away it'll jump up to a good 4.5 kW but then taper back to about 4kW as the panels heat up again. But all that being said, you are quite correct in saying the device in this thread is a scam. V3Solar We have documented the temperature many times. Basically if the unit is spinning at 240 RPM under 40X concentration the temperature gain is negligible. I borrowed a Nikon 7000 from a friend to film the event. I filmed for about 10 seconds and then both memory cards were full. I cleaned them up tonight and will film today. Silly mistake. I should have checked, but we have been a bit busy... We will have a video out on the CoolSpin that explains the whole unit. The first telephone call was not made with an iPhone There is much development that remains to be done. We have proven the concept. Really? Okay then, where's the video? Concentrated Photo-Voltaics are nothing new, the key is in cooling, so the question is how are they cooling their demonstration rig? More importantly, how do they plan on keeping the guts cool inside a sealed cone? And what aspect of that 8th grade science project took soooooo much time that they forgot to bring a video recorder to their own freakin' demonstration trying to lure investors? Seriously? Their cooling seems to consist of spinning it really fast (which would obviously not work under the cone), and effectively not concentrating it at all, by only exposing a bit of the cell at once to the concentrated light. Here's what it would look like it it were actually concentrating the light 20x as in their demonstration. I just wrote to Grist E-Magazine and also just sent the following by email to Robert Styler of V3 Solar. Your responses on the V3 Solar Facebook page are neither satisfying nor convincing. Everyone expected to see a completed, as pictured, fully functioning unit producing the electric output claimed. Per Lyngemark asked you a simple question about a fully functional unit. But you did not answer the question. WHY? Time to show the real McCoy and to keep your promise!! YOUR ANNOUNCEMENT>>>"Once people see the CoolSpin working live, it will remove any confusion regarding the technology. I have also written to Grist expressing this same concern. Not the SpinCell, it seems at all. But something different called Cool Spin. I am fed up and disappointed. Treating people like children with cartoons of a fake product and then a big switcheroo!! Mick, your comments on the new design, please? They claim that "Cool Spin" is any system in which a PV cell spins, the "Spin Cell" is just an example of this. Of course the "Spin Cell" is nothing at all like this. There is NO 20x area concentration in the "Spin Cell". 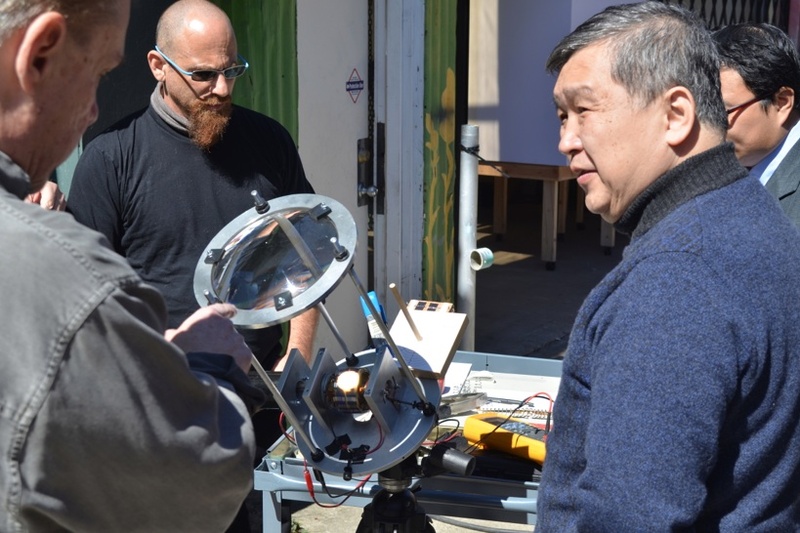 The demo shows 10 PV modules on a spinning drum, with a (claimed) 20x magnifying glass, with manual tracking to align it to the sun. They compare this against a single PV module. The axis of the drum and the plane of the single cell are perpendicular to the sun for the test. So if you take these numbers at face value, then it sounds like putting the cells into this contraption makes the (2.90/0.11*10) = 2.6x as efficient. The "power" measurement is in Amps. Power is actually measured in kWh (kilowatt hours), or just Watts for a point measurement. Watts = Amps * Volts, so to know the watts, you need to know the volts. So basically the above readings don't tell us much about how much power the different setups can actually generate. But let's take it at face value, and assume that the spinning concentrated PV drum gives 2.6x as much actual peak power as the same cells spread flat. What is actually being demonstrated here? So you've got 1.5 cells with 20 suns generating 2.90 Amps (2.90/20/1.5 = 0.096 Amps/Cell, and 1 cell with 1 sun generating 0.110 Amps/Cell. Yes you are still getting (theoretically) more efficiency for the number of cells used. But that's simply standard LCPV (Low Concentration Photovoltaics), or which there are multiple approaches. In theory you could get a similar spot measurement simply by sticking a 3.0x magnifier over the single cell. 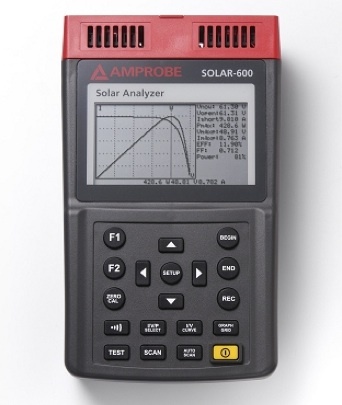 Power output also varies with temperature, and the spot measurements don't include temperature. Presumably the drum would have been covered to prevent he concentrator damaging it while it is not spinning (which raised the obvious question of what happens when it stops spinning in the wild, will it burst into flames? ), but was the single cell covered? What were the temperatures? What were the reading after 30 minutes? An hour? In summary the demonstration shows nothing more than the very rough ballpark figures for what you would expect for concentrated sunlight. The lack of information on load, temperature, actual solar concentration geometry, and variation over time makes the results essentially meaningless. And even if the figures were accurate - why compare it to a bare PV cell? Compare it to one with a 3x concentrator, seeing as that's the actual competition. 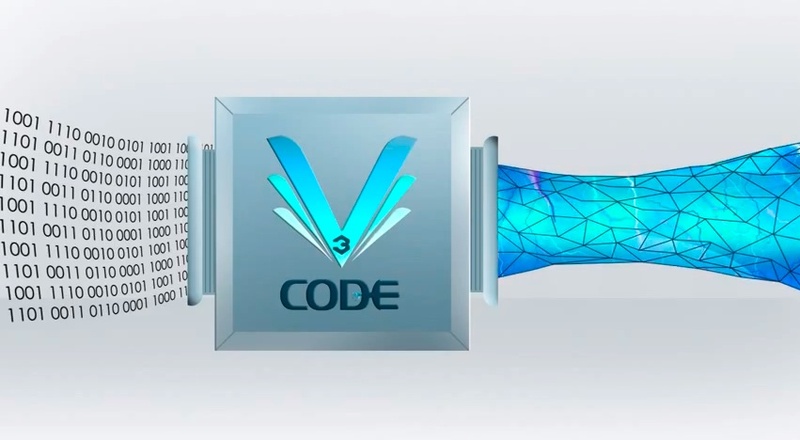 This is the V3 Solar write up on their Patented Cool Spin system. NOW we know....this is NOT to be confused with the fictional Spin Cell, cone-shaped PV system. Not a clue given about what a commercial "Cool Spin" unit would even look like. Robert Stryker apologized to me for the confusion caused by the similar names. I don't consider that sufficient. This was a cleverly arranged diversion. He asked me... "What motivation would we have to mislead people?" As if millions in potential investment dollars is not the goal. Once again treating people like children or worse, like fools. The first fully functional prototype based on our core “Coolspin IP” was put on display last week to audiences including a large delegation from the Taiwan government as well as others from the Netherlands, India, Mexico, and the U.S. (representatives from the Economic Development Councils of the States of CA, OR, and CT, also attended). Coolspin is moving quickly towards commercialization with product expected to roll off production lines by 1st quarter next year. For those of you who weren’t able to attend one of our presentations last week, we have put together this short video, which highlights the performance gains our unique “Coolspin” technology delivers. 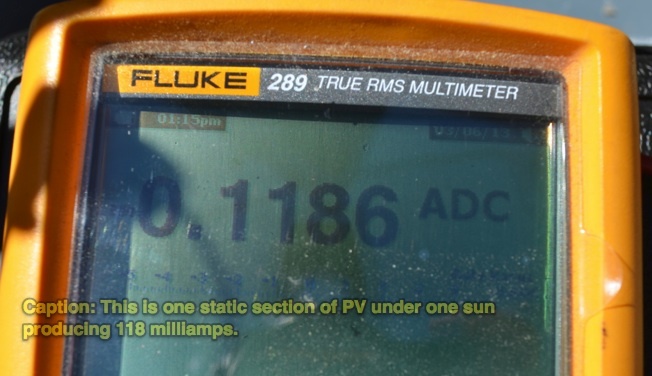 We used two fluke meters to measure the performance of the control PV and the CoolSpin device. 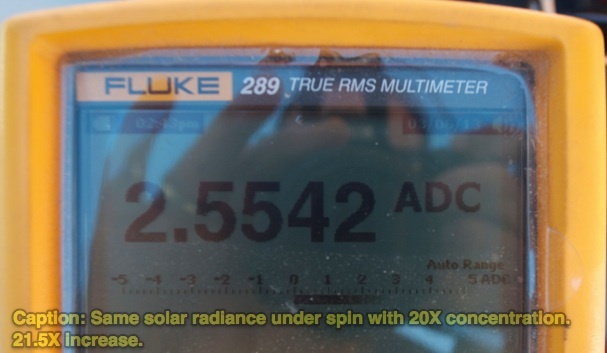 • The second Fluke Meter is connected to the CoolSpin proof of concept unit with ~20X sun concentration. This prototype had ten facets of PV, each consisted of two sections connected in series, just like the control. In production, this will be a long tube, not a short section. The control under one sun produced 111 milliamps. The CoolSpin under ~20X concentration produced 2.9 amps, or 26X production. Since there are 10 facets, this creates a net 2.6X increase. This is like fine tuning an engine with 10 pistons. With the proper timing and power electronics, the math shows we can get up to 3.5 to 5X increased power output with this design. We can also reduce the number of facets and increase the concentration. With 8 facets under this configuration it would be a 3.25X net. With 5 facets it would be a 5.2X net. 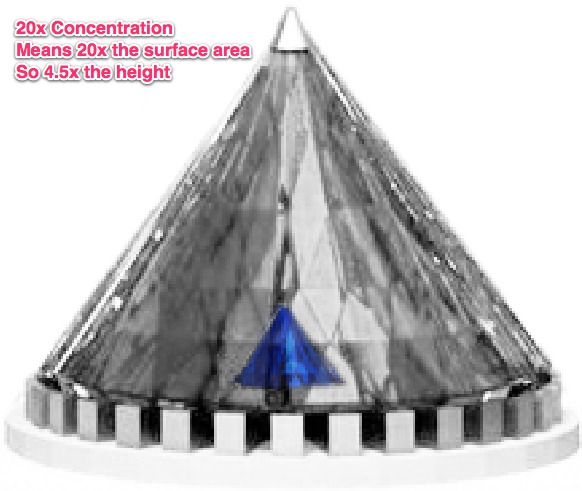 With double the concentration and 5 facets it would be over a 10X net -- and that is before any further refinement. 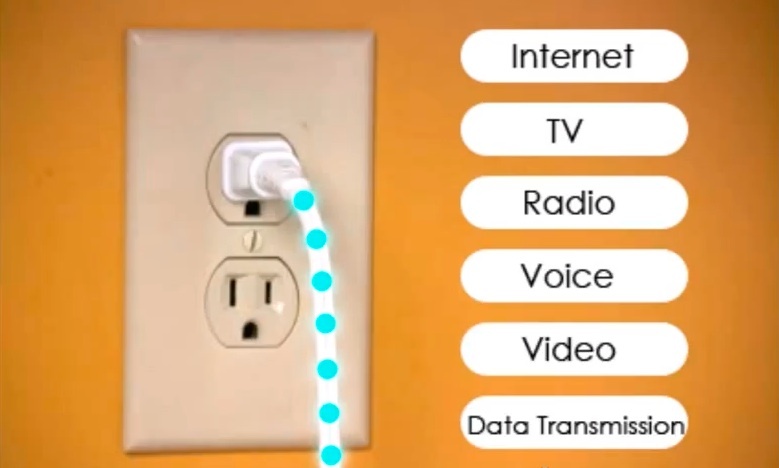 There are numerous options to up the power output for the future. You can also keep up to date at: www.Facebook.com/V3Solar(and please “like” our page). 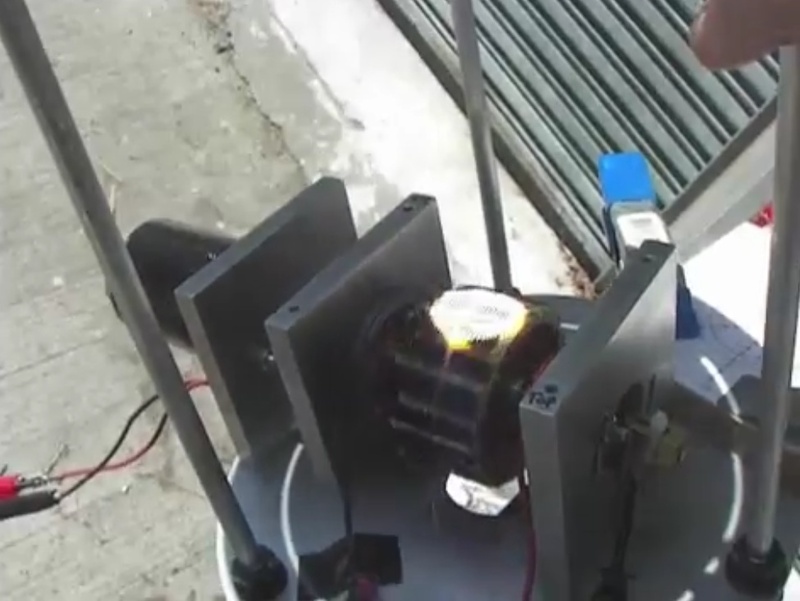 In this demo, the electric motor that is spinning the cylinder is oversized. In production it will be tiny, as the tube will be light with very little resistance. Some people thought we were demonstrating the conical Spin Cell design (Spin Cell and CoolSpin are easy to confuse). The Spin Cell is our flagship, requires more R&D, and is scheduled for production towards the end of 2014. CoolSpin will be our first “to market product” with a Total Cost of Ownership significantly less than flat panel PV. Alexander Graham Bell did not make the first phone call with an iPhone, and the first commercial application of dynamic spin will not be with the Spin Cell. Rest assured, we will be commercializing the Spin Cell that has generated so much excitement. The significance of this demonstration should not be missed. 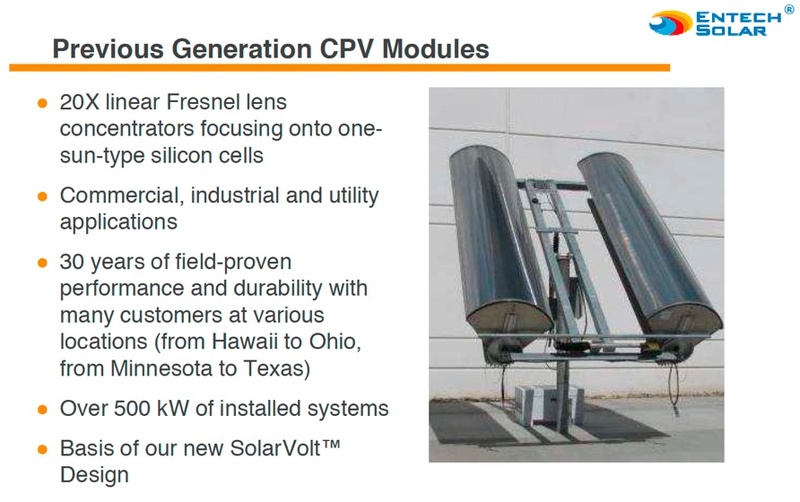 Normally Concentrated PV (CPV) requires triple junction cells, which cost ~$400/Wp. For the first time, under intense concentration, we can use one sun mono PV, which costs about 75 cents/Wp. In this example, we used 10 facets, so that would be $7.50/Wp. Triple junction is up too twice as efficient, so it would be the equivalent of $15/Wp for what costs the competition $400/Wp. Of course we also have a small motor to spin the tube, which costs about $5 and uses a small amount of energy, but it is less than 1% of the production power. All of our numbers will be net, so if the unit produces 220 watts and it uses 2 watts to spin the tubes, it will be rated at 218 watts. V3Solar is the first company to “flash” PV in sunlight – not for testing, but for commercial production. The results speak for themselves and the possibilities are inspiring. the whole point is that we can concentrate 20 suns on one sun mono PV with no heat issue. If there was no concentration, there would be no advantage. The problem with CPV in the past is that you have to focus on triple junction cells, which cost ~ $400/Wp. It is all broken down in the email above. This does not seem to be true. CPV is classified as Low, Medium and High. Low (LCPV) can use regular cells, certainly up to 20 suns. Hence you could just take the single cell, and use a 20x concentrator, and you'd be doing better, for 1/20th the number of cells. EnTech new model is substantially smaller and more efficient. At least now we are talking about real world products. There is an active air exchange between the inner and outer cone of the SpinCell and within the tube of the CoolSpin. There is no "greenhouse effect", as you claim. I understand that "hermetically sealed" was stated in the video. The power electronics and PV are hermetically sealed, not the entire unit. This has been explained several times. Again, as we have explained, the graphics of the SpinCell do not represent the actual design. There is much more distance between the inner and outer cone than shown in the animation. We will have better graphics up with our new website, which is coming soon. Of course there is concentration of the sunlight, or the entire system would not work. You are missing the whole heat issue. PV efficiency decreases .45% for every 1 degree increase in Celsius. We maintain a temperature within 15 degrees C of ambient even under 40X concentration. The focus now is to see how high we can push it, as our costs decrease the more we increase concentration. One of the challenges is that one sun mono PV is not designed to handle intense concentration. The crystalline structure can handle it, but the bus bars can't pull off more than about 20X. So to fully test the potential we are having to explore specialized PV with more robust, back mounted bus bars. 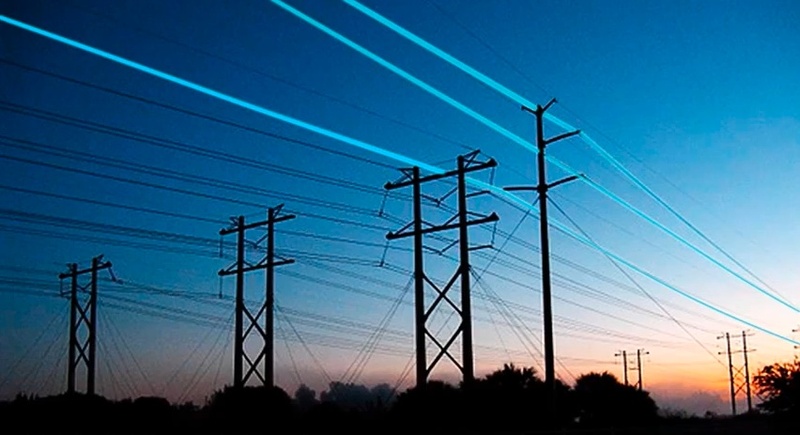 The bottom line is the Total Cost of Ownership and the Levelized Cost of Energy. The solar experts who have signed NDA's -- the people who have the full information and have flown out and seen our technology -- understand the paradigm shift dynamic spin creates. You have stated several times that you are not a solar expert, so I understand your confusion. Even if you were an expert, you don't have all of the information. I have been in solar for 7 years, and we still flew out Bill Rever and several others to make sure what we have is real. Someone emailed me your link and I was amazed why anyone would spend this much energy and time on something they clearly don't have the proper information to vet correctly. I understand and appreciate a healthy skepticism, but your comments are closer to libel. We are a small company with a very big idea. This is the most exciting technology I have ever been involved with and we will continue to document our results going forward. We still have plenty of work to do. The potential is inspiring and there is no greater feeling than working toward a worthy goal. I have no desire to get into a dialogue or debate. I just wanted to clear up some of the clear misunderstandings. Our new website will have more specifics that should remove any confusion. ... I was amazed why anyone would spend this much energy and time on something they clearly don't have the proper information to vet correctly. I understand and appreciate a healthy skepticism, but your comments are closer to libel. I think it's time for you to hire a public relations adviser. I certainly would not address criticism of a product with ad hominems and veiled threats. Think... "How would Ginni Rometty handle questions about her products?" It has moving parts, working under atmospheric conditions, including an electric motor. We're supposed to compare that with a solid-state device? How the heck could that ever be an improvement? Just curious what experience you have in the Solar Industry? I'm not try to create controversy, the controversy already existed well before I came along. In fact I first became aware of your claims when someone on Facebook posted at link to the grist.org interview with you about the controversy. I'm simply re-raising issues that you don't seem to have addressed very well, and raising new issues as they occur to me. They are relatively simple issue of math and science. And it still makes no sense. You have an upside down glass cone. Hot air rises. You've got about half a cubic meter of hot air in there. Spinning the air around is not going to get it out. 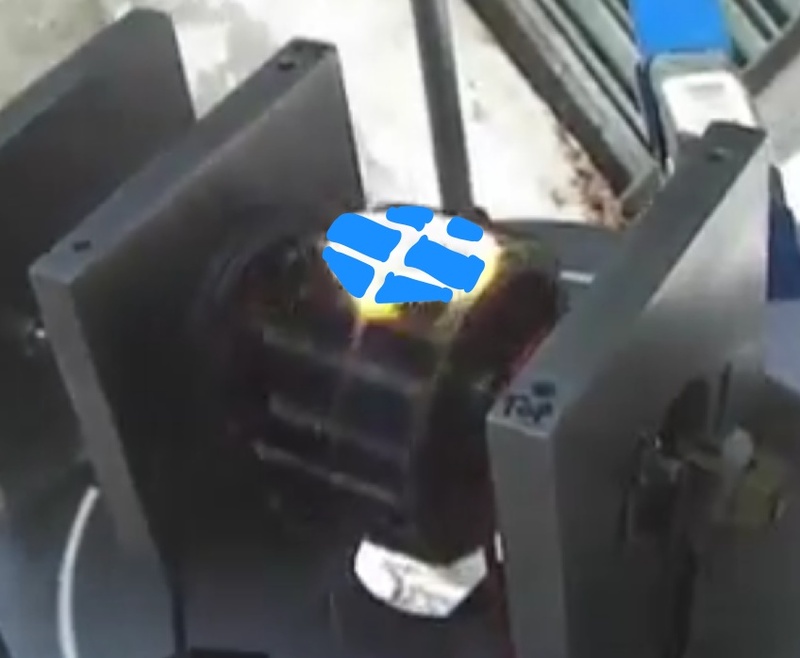 Why not remove the half of the glass cone that is not facing the sun, and replace it with a grill (or just build the grill into the back half of the cone when you mold it). PV is about 18% efficient, how can V3 be 20X more efficient than that? We are not 20X more efficient. We increase the amount of light by 20X that hits the PV, which increases the production of the PV by 20X. It has long been known that concentrating light increases production. The problem has been the associated heat. When we put a 20X concentration on flat, static panels, the temperature quickly reaches 260 degrees F and the PV fails. With the same concentration on the Spin Cell, the temperature never exceeded 15 degrees F above ambient. This is a breakthrough. By using the outer cone lensing to concentrate 20X more light, we get 20X more production using 1X Sun mono PV. In the past, this level of concentration has always required exotic and expensive material like triple-junction cells. Of course, the lensing cone is larger to gather more light and focus it on the smaller, inner PV cone. And those little ridges are not going to do any concentrating. You'd need a full surface Fresnel arrangement to angle the light down, but then you can't use fresnel to angle it IN, because the sun moves. In fact I think it's physically impossible for a symmetrical cone shape to concentrate sunlight into a smaller cone shape from the full area of the outer cone. And in the above, you say "In the past, this level of concentration [i.e. 20x] has always required exotic and expensive material like triple-junction cells." I assume by "in the past" you mean "before we invented this technology", however this is simply not true, Low Concentration PV (LCPV) can use regular cells on a heat sink. See the posts about Entech, above. They have been using 20X concentration on one-sun PV cells, and have multiple installations in the field. Of course you can maintain the temperature, because you are NOT ACTUALLY CONCENTRATING THAT MUCH. If you concentrate 20X onto multiple cells on a drum spinning in the open air, then the actual concentration is needs to be multiplied by the fraction of time that any one cell is in the spot of sun during a rotation. It's hard to calculate without the precise dimensions of the magnifier, the sun spot, the drum, and the cells, but ballpark it looks like each cell is only in the sun for about 10-15% of the rotation. So really it's just a 2-3X concentration. The metal drum acts as a heat sink, and of course it's spinning round in open air, so it's not surprising it stays cool. What seems misleading is that you constantly talk about the cells being under a 20X concentration, and trying for a 40X concentration. But they are not, the effective concentration is much lower. Yes, I've seen Rever's Technical Review. While there are many design concepts contained in the Spin Cell, the most fundamental innovation is the ability to use one sun cells in a concentrating system operating at 20X concentration or above. The main issue to resolve is temperature which at 20X concentration can quickly rise to destructive levels unless heat transfer out of the cell is enhanced. Tests conducted by V3 illustrated in the charts below show that the spin cell concept can solve this problem. Yes, you do it by only actually having a 2-3X concentration by using 10X the number of cells. Finally, a hypothesis currently being tested is that a “cascade effect” can occur as cells are cycled through the sequence of illuminations by different lenses in the spin cell. This effect has been shown to occur to an approximate value of 20% when looking at the short circuit current of a cell receiving a sequence of pulses of light. The effect on the output power (driving current into a load) and energy (power x time) in each pulse are now being measured. There's the meat. The problem is that to get this 20% increase you need to pulse the light, which means you are not using the light when off, so you've got to concentrate the light, and/or add more cells. But 20% is a small increase if you need 10X the number of cells, even if you only need 2X the number of cells. Why not simply concentrate the light 2X on a single cell, and you'll have a 100% increase. And this is just a 20% increase in the short circuit current. You've never released any information about the current under load, or the actual energy production, which is really the important measure. If you make public claims then you should expect public scrutiny. I feel that I, and many others, have raised very valid concerns about the claims you have made. Unless you can reasonably answer those concerns, there are going to be questions about the viability of your business. I'm quite willing to accept that you believe in your technology, and there's either been some miscommunication, or simple error, that led to the questions I've raised, but those questions still remain. The spin cell concept has substantial IP protection covering all aspects of dynamic spin in PV and this IP should be highly valuable when the spin cell has been reduced to practice. Since the concept is highly visible any imitation would be difficult to accomplish without a presenting a public violation of the IP. So what are your patent numbers? And if the protection is so strong, then why the need for NDAs? 2) Why claim you are doing 20X concentration when it's effectively less than 3X? 4) How is is possible for a large symmetrical cone to concentrate sunlight 20X onto a cone 1/4.5 the height and diameter for the full day? 5) What does the Spin Cell actually look like? 6) What are the patent numbers? I live in Los Angeles, and would be happy to meet with you at your Encino office (no NDA) if you would like to explain and/or demonstrate any of this. None at all. I'm curious as to why you think this pertains to my questions? Do you think I'm a mole for a competitor, or just ill-informed? If I'm misunderstanding something here, then surely it can be explained, rather than hand waving it away with "oh, you have no experience". I ask very specific questions about issues that are really not that complicated. If the questions are wrong then explain why they are wrong. If they are not wrong then answer them. Show us the data then because according to the following research, pulsing the light hitting the panel has a negligible effect on efficiency. Hiding behind NDA's when confronted with fairly basic questions is quite suspicious, imo. Just sayin'. I would like to see what the output was if they just shut off the motor on the demonstration unit. And maybe some temperature readings could clear things up. I am glad I didn't waste my time going to this demo. This is somewhat analogous to a perpetual motion machine. What happened to that Irish zero-point energy venture? A friend of mine once insisted that a small windmill generator on his handlebars connected to an electric motor driving his rear bicycle wheel would fairly push him along. More seriously, even if the concept actually worked. That idea is ridiculous, but going with it, the product cannot last. Shaft bearings will wear, and out-of-balance forces will change its performance for the worse. No plastic is light-resistant. Such a moulding will fall apart in sunlight. Crazes will appear wherever a section change occurs. Water penetrates these easily, and then water will WRECK* the moving parts. A hollow hemisphere is the safest object to mold for this purpose (enclosure), with the "optics" inside. That alone tells me all I need to know about this device and its promoters. Well, yes.... perhaps the Entech product info and logo contained here, may lead to those speculations? But the lack of technical solar knowledge displayed confirms the ill-informed mode, you have suggested. As with any new and game changing product, the details are fluid and adapt to the process, as it occurs...that's how things are advanced. Any effort to stifle that is contrary to progress. ... Any effort to stifle that is contrary to progress. And any effort to understand the engineering and physics and make it clearer is helpful to that progress. If someone can see that your maths is wrong at some point in your equation that is helpful. Producing something that doesn't work or trying to obscure its details under something flashy is not progress. But the lack of technical solar knowledge displayed confirms the ill-informed mode, you have suggested. I endorse everything Mick says. I have FORTY years' experience in both engineering and product design, having trained at RAE Farnborough, and Central St. Martins, and invented a few things in my time. I don't see any "progress" here. I also don't see how asking questions can possibly "stifle" anything. Are you going to answer Mick's questions?